The newly renovated Holiday Inn Orlando International Airport is located less than one mile north of the Orlando International Airport. The Holiday Inn Orlando International Airport is convenient to the Orange County Convention Center, University of Central Florida, Port Canaveral, Sea World, Walt Disney World and Universal Orlando. 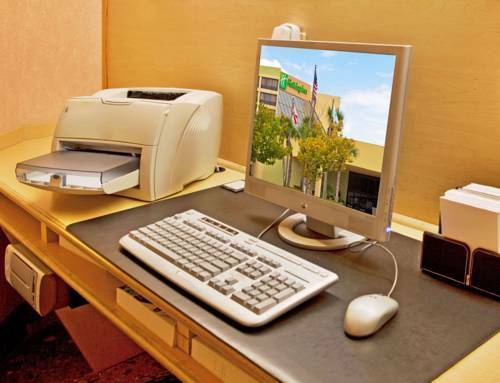 The hotel is close to the Florida Turnpike and Interstate-4 and moments from SR-528 and 417 Expressways. Nearby to Simcom, Siemens, Nat'l Air Cargo, Flight Safety and US Tennis Association. Drift Kitchen and Bar is open daily for breakfast, lunch and dinner. You can relax after a long work day or day at the attractions with a drink from the bar. All guestrooms in this Orlando hotel are equipped with multiple data access points, refrigerators, Keurig coffee makers, flat-screen TVs, hairdryers and irons and boards. Free wi-fi is available throughout the hotel. Room service is available. The hotel offers free shuttle service to and from the Orlando International Airport, outdoor pool and whirlpool spa, tennis/sports court and fitness center. Our 7,500 square feet of flexible meeting space can accommodate up to 620 people with banquets and catering services available. Business center computers are located in the main lobby. Whether traveling for business of pleasure, the Holiday Inn Orlando International Airport hotel in Orlando offers newly renovated guestrooms at affordable rates. Gallery Ballroom: Air-Wall divides this room into three sections, Gallery 1, 2, and 3. Gallery Junior Meeting Rooms: Air-wall divides into Gallery 4, 5, and 6 and can be used as breakout rooms for smaller educational meetings. Florida MallCentral Florida's largest mall with over 260 stores, including Macy's, Dillards, JC Penny's, Sephora, MAC, Apple, Best Buy and more. Featuring the brand new Crayola Experience and many restaurants and eateries to choose from. Universal Studios & Islands of AdventureHome to some of Orlando's biggest superstars Universal Studios Florida, The Wizarding World of Harry Potter, Islands of Adventure, and the brand new Volcano Bay waterpark should be at the top of your to do list whe you're visiting us in sunny Florida.